CHARLOTTE, NC (WBTV) - American Airlines has canceled thousands of flights as the winter storm approaches southeastern areas over the weekend. The airline says the storm is impacting its operation and they have a team of meteorologists closely monitoring the track of the storm. As of 8 p.m. Saturday, American Airlines, along with their regional partners, have canceled 225 flights Saturday, 1,100 flights Sunday, and 300 flights Monday. Customers are encouraged to check the status of their flight on aa.com before departing for the airport. Due to the anticipated winter weather at Charlotte Douglas International Airport, American Airlines will reduce its operation at the airport starting Saturday evening. Scattered cancellations are expected through Monday morning. The majority of these cancellations will be on smaller, regional aircraft. Charlotte Douglas says the majority of those cancellations will be on smaller, regional aircraft. Due to the anticipated winter weather at #CLT, @AmericanAir will reduce its operation starting Saturday evening. Scattered cancellations are expected through Monday morning. The majority of these cancellations will be on smaller, regional aircraft. Check with American for more. 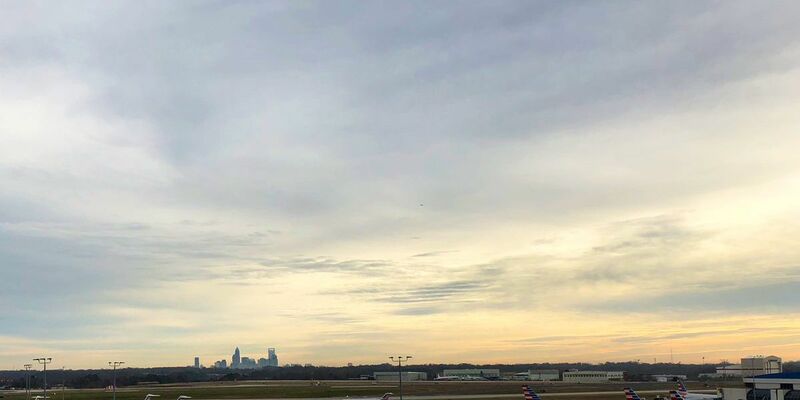 The travel alert which was issued Dec. 6, covers 17 airports in eight states, including the airline’s Charlotte hub, and allows customers whose travel plans are impacted by the inclement weather to rebook without change fees. Customers can reschedule their travel on aa.com by retrieving their reservation, using the airline’s mobile app or by contacting American reservations at 1-800-433-7300 in the U.S. or Canada. Customers calling from outside the U.S. or Canada should check aa.com for our worldwide reservation phone numbers. If an American flight has been canceled or excessively delayed, customers may rebook on aa.com by retrieving their reservation or using the airline’s mobile app. Customers may also cancel their itinerary and request a refund by visiting the airline’s website. Customers who booked through a travel agent are requested to contact their agency directly. As of Saturday at 5 p.m., Charlotte Douglas International Airport is open and operational. The airport says all three parallel runways are open, and the airport’s snow teams are being activated. The airport is recognizing that airlines are reporting cancellations Saturday evening through Sunday. Travelers are advised to visit flightaware as well as the FAA real time flight information map for updates. The airport says airport roadways, overpasses and parking lots were pretreated Friday night, and that retreatment of the airfield takes places Saturday night. Deicing of aircraft has begun and is expected to continue tomorrow on Runway 5/23. Airport officials say they continue to work with its partners and airlines to accommodate passengers. Conditions are subject to change and travelers are encouraged to frequently check with their air carrier for any cancellations or delays before coming to the airport. Travelers can receive the latest updates by following CLT on Twitter.